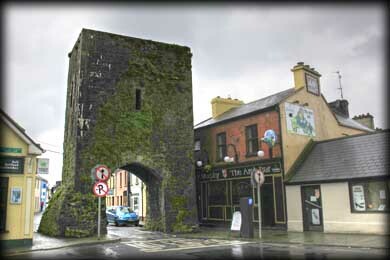 Athenry is a delightful medieval walled town with one of the original 5 town gates still remaining. This remaining northern gate stands less than 100 metres from the castle. 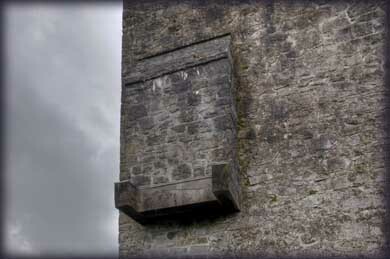 There are also five of the original six towers remaining in the towns curtain wall. Richard du Burgo (Burke) granted a charter for the land to Meiler de Bermingham who built his castle in c.1235 to guard the crossing point over the Clareen River. The castle originally included a "hall keep" with a very pronounced batter. 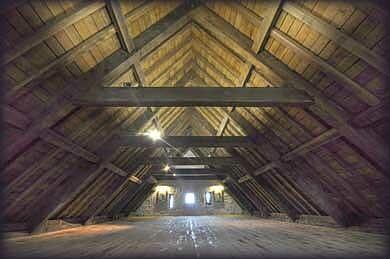 In 1235 it consisted of only two stories -- a storeroom at ground level and a great hall on the first level. 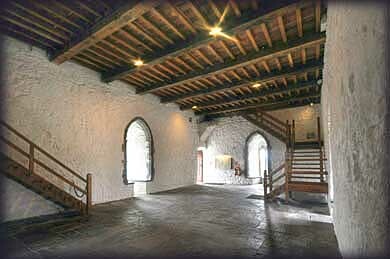 The only entrance was on the first floor via an external wooden stairway similar to the modern reconstruction. As we entered the Castle on the first floor we were delighted to find the capitals on the exterior of the doorway and also the inner side of two of the window openings are carved with floral motifs, in a transitional style between Romanesque and Gothic, similar to the abbeys of Cong, Ballintubber and Boyle. These carvings are unique in a castle. By c1250 the keep was raised to form a taller great room. 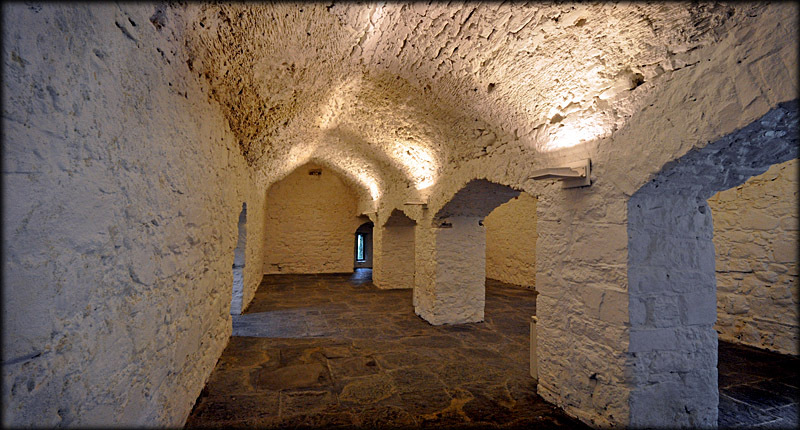 It is believed that the basement, with its only access through a trapdoor and ladder from the great hall wooden floor above, was transformed in the 15th century with the addition of stone pillars carrying a stone-vaulted ceiling, see image below, and the insertion of a door at ground level. It is not known why this alteration was made but it may have been necessary for storing heavier or more dangerous material as would be used by a garrison for soldiers. While the battlements are original 13th century work with tall arrow loops or slits, the parapets at the north and south ends were incorporated into steeply pitched gables to support a new roof added in the 15th century. This new roof made the central hearth obsolete so it would have been removed at that time. 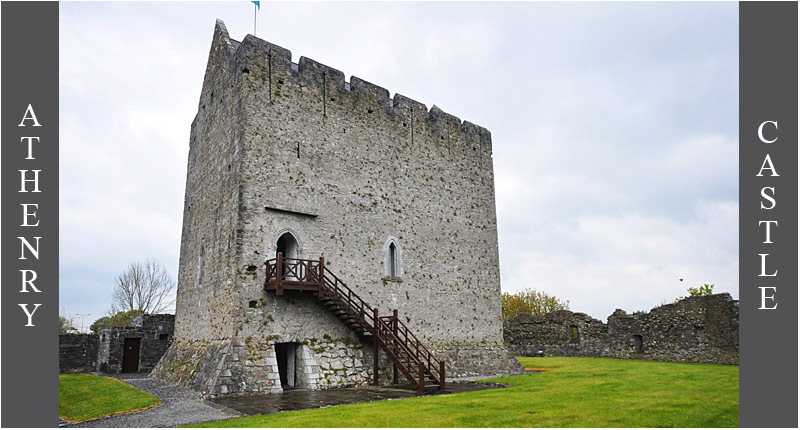 The castle was attacked by the O'Donnells in 1597 and laid to ruin for nearly 400 years. 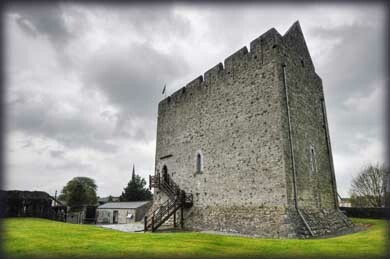 The OPW restored the castle to how it looked prior to the attack. In addition to the castle keep, there are parts of the original bawn including one of the rounded corner turrets and some remains of a banquet hall. Situated: Very easy. Located in the very heart of the town directly opposite the Dominican Priory.